I really appreciate great cover bands as "The Machine" on stage (with the agreement of Floyd actually), they deliver such beautiful yet nostalgic live sets. They are really faithful to the spirit of the Floyd as Mostly Autumn here. "The Machine" has even played a gig of more than SIX (6) hours (with some breaks I guess). It is always a pleasure when a band reaches such a level of professionalism ("The Musical Box" is another fantastic example for those of you who have never seen a genuine Genesis live set). So, a Pink Floyd cover album. Just a great idea ! MA has always declare their filiation and love for this giant. Wright has told all the goods that he was thinking of their work and the similarity of some of their great songs with PF ones. It seems that this was the kick for MA to perform a live performance dedicated to one of the most brilliant band described on PA : Floyd as I like to call them. The choice of songs is as it is. I am not sure than both "Pigs On The Wing" are essential...Maybe a way to open and close this live set as the Floyd did on "Animals"
"Echoes" is one of my fave PF songs as "SOYCD" and "SOC" and "STCOTHOTS" and "COTAE". But only "Echoes" is featured on this live set, probably to give the opportunity to the great and beautiful Heather to have some kind of a role. Which is frankly reduced here. Some backing vocals here and there ("Echoes" for instance). To get back back on "Echoes" it is really a good version : only emascultated (I like that word) of a part of the "spacey" moment (which is not a crime) and with a less flamboyant finale (which is more prejudicial). I would even say that their interpretation of "Fat old Sun" is superior to the original. "The Brick In The Wall" being average and "Sheep" a bit chaotic. With "Julia Dream" we really enter into the intimate Floyd repertoire. 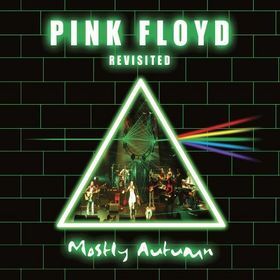 Their fourth single and first Gilmour composition. Maybe a tribute to Dave and his enourmous influence on MA. Because, as such, this early Floyd song has really nothing to offer. But like Heather will introduce "Is anybody feeling psychedelic " ? This song will allow to get her on the lead. Unfortunately, it is not really a highlight (but the original was just a poor song as well, so there is no wonder). And now something completely different will introduce Bryan (Josh). And here we go for a great version of "Hey You". But the whole of the last part of this live set will be very strong. A little bit more of Heather during "Comfortably Numb" which will feature a great guitar finale of course. It is just astounding that they will not cover Floyd's late work (after the departure of our "dear" Roger). Since their influence is more Gilmouresque than anything else I would have expected some later releases, but this set is really good as such. So, let's not complain too much. There could be a different live compilation for each Floyd fan on earth, I guess. To listen to this improbable one, I can only recommend you to go and watch "The Machine" on stage. This album is a great way to remind us great times, which will never come back again (unfortunately) that's for sure. Four stars for this good MA cover album.